Highlighted Species in our Watershed! Fourpole Creek Watershed Association (FCWA) is a watershed group based out of Huntington, West Virginia. The watershed unifies a diverse community that includes rural agricultural areas, industrial zones, neighbors and urban parks and recreation lands. Fourpole Creek is a central feature of the City of Huntington parks landscape. 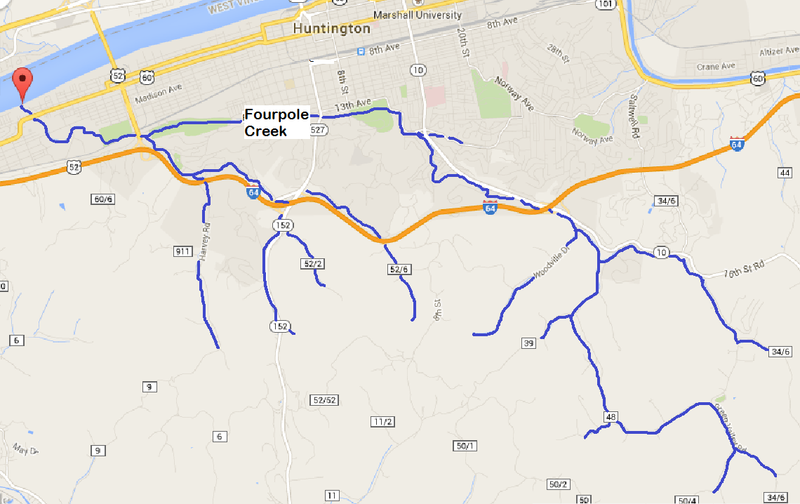 Visit this interactive map to explore Fourpole Creek! Our vision is to support and implement an integrated management of the Fourpole Creek Watershed’s aquatic and terrestrial resources to achieve and maintain sustainable recreation, ecological integrity, public safety, and an improved quality of life for residents, schools, property owners and agencies within the watershed. can’t make the meeting Tuesday 3/8, can you provide info on this web site that is covered in the meeting? Visited with your group in Feb. Am very interested in the school project on erosion. Who can I contact? Hi Hazel! You can email us at fourpolecreekwv@gmail.com or attend our next meeting on April 11th at 6:30pm at the OVEC Building in Huntington. Thanks for your interest!